I was in Chinatown last weekend shopping for Chinese provisions to bring back to Harlem. To my delight I noticed that dong sun (冬筍), or winter bamboo shoots, are in season. 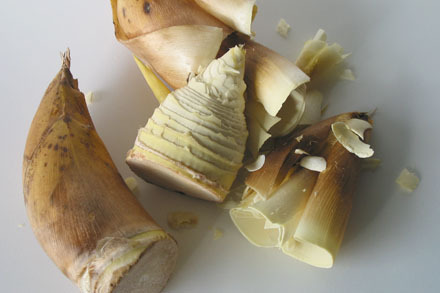 Winter bamboo shoots are one of the prized vegetables, along with dong gu mushrooms (冬菇 or winter mushroom) eagerly awaited in markets by shoppers in China during winter. They used to be two of the few fresh vegetables available during the harsh winter months. Therefore they are revered and commonly paired in winter dishes. Winter bamboo shoot, the very young tender shoot of a bamboo variety during winter, is something that one has to sample to understand why it is so sought after. It is nothing like the normally available larger variety, either fresh or canned. It has a much crunchier texture and subtler flavor. When used in stir-fry or soup it can provide a nice contrast in texture and freshness in flavor to other vegetables or meats. For many years they were only available in canned form in America. However in recent years they have been air flown from China to Chinatown markets during the season, which lasts from January through March. On the other hand dong gu mushroom (winter mushroom), which is a variety of Shiitake mushroom, has been available in Chinatown markets for years. This variety of mushroom is commonly cultivated during cold weather, and hence the name of the mushroom. It is now available year round in Chinatown. This mushroom can be identified by the cracking pattern on the cap. It has a very smooth tender texture when cooked and is often used in Buddhist vegetarian dishes to imitate meat. It is also commonly available in dried form and used extensively in Chinese cooking. 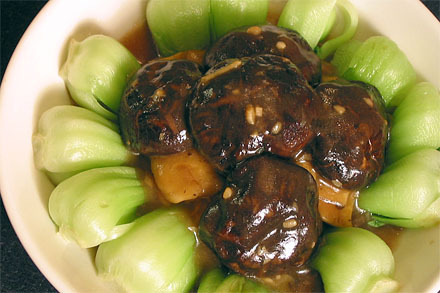 A dish that pairs these two winter vegetables, called Double Winter Delights (蠔油炒雙冬), is one of my favorite winter dishes. I love this dish because of the contrasting texture and flavor between bamboo shoots and mushrooms, creating a wonderful taste sensation. These two ingredients are stir-fried then simmered in oyster sauce resulting in a smooth savory dish. Remove the outer leaves from the shoot till the heart is exposed. Cut the shoot lengthwise into halves. Then slice crosswise into slices about an eighth of an inch thick. Set aside. Remove the stem of the mushrooms by cutting it off from the cap. Set aside. In a wok heat the vegetable oil until just at the smoking stage. Add the garlic and brown for about half a minute. Put in the bamboo shoots and the mushrooms and continue to stir-fry for about another minute. Be sure to stir constantly to prevent from burning. Then add white pepper, light soy sauce, oyster sauce, Shaoxing wine and clear stock. Cover the wok and turn the heat down to simmer for about 5 minutes.In the mean time blanch the bok choy in boiling water for about two minutes. Drain and arrange in a circle on a round shallow plate. An alternative method to blanching is to cook the bok choy in the microwave. Arrange the bok choy on the plate and cover with plastic wrap. Then cook in the microwave at high setting for two minutes. Now uncover the wok with the bamboo shoots and mushrooms, and thicken the sauce with the cornstarch slurry. You can adjust the cornstarch to the thickness of your liking. 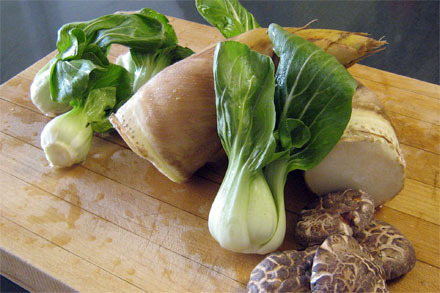 Scoop the bamboo shoot and mushrooms over the bok choy and arrange decoratively. Serve immediately. If you’re unable to obtain fresh winter bamboo shoot and dong gu mushrooms you can substitute with canned bamboo shoot and dried shiitake mushrooms. You will still be able to enjoy a very satisfying dish, even though you will not be able to sample the extraordinary taste of these fresh ingredients. The green vegetable can be replaced with regular bok choy or iceberg lettuce. Your website seems to me close to Ken Hom in his better, early days, sadly long past, and I hope you will maintain the high standard and be able to expand it as other demands on your time allow you. My immediate reason for this posting is: why do you exclusively suggest corn starch–isn’t water chestnut flour superior in quality? I use it exclusively–perhaps because of my ignorance? 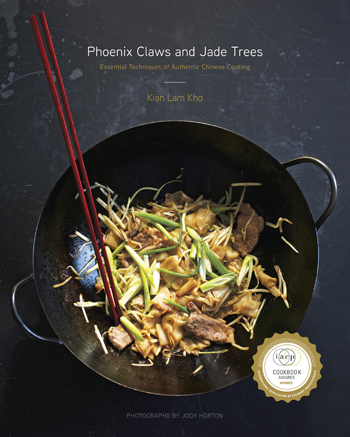 Hi KH Kinzl, Of all the different starches I find tapioca starch being the most desirable for Chinese cooking. It makes a very velvety smooth sauce when used properly. However, for most people cornstarch is the only type readily available. That’s why I generally suggest the use of it. The “water chestnut flour” you mentioned I believe is in fact arrowroot starch. This is commonly used in southern China and Taiwan and is excellent for used in Chinese cooking as well. My advice: use whatever is readily available. You may want to adjust the quantity slightly since each type of starch can result in different viscosity.